We publish this article of the New Zealand Civil Defense Emergency Management to make sure that people will follow the right protection guidelines and to avoid the always returning confusion on what to do when an earthquake strikes. The advice from civil defense and The NZ Society for Earthquake Engineering comes in response to a widely circulated email by a self-professed rescue expert. Information on “Triangle of Life” in the email contradicts current advice on what to do in an earthquake. Although the email source has been discredited in the US, where it originated, the emails have been virulent enough to create some public concern both in the US and in New Zealand. Standard advice in New Zealand for what to do in an earthquake is to drop, take cover under a sturdy piece of furniture, and hold on, or shelter against an interior wall away from windows, bookcases etc. That advice still holds true and has not changed says John Hamilton, the Director of Civil Defense Emergency Management. “This practice will protect people in most earthquake scenarios. “An immediate response to move to the safe place can save lives. And that safe place should be within a few steps or two meters to avoid injury from flying debris,” says Mr Hamilton. Graeme Beattie, who is president of the NZ Society for Earthquake Engineering and is a structural engineer at the Building Research Association of NZ, says that each year about 70 damaging earthquakes occur throughout the world. New Zealand experiences hundreds of earthquakes every year but most of these are either very deep in the earth’s crust or centered well offshore, and cause little damage or injury. But over 100 quakes a year are big enough to be felt, and a severe one can occur at any time. “Ground vibrations during an earthquake are seldom the direct cause of death or injury. Most earthquake related injuries and deaths result from collapsing walls, flying glass, and falling objects caused by the ground shaking,” says Mr Beattie. Filed under: Earthquake linked subjects, Earthquake Preparedness | Tagged: drop cover and hold, earthquake guidelines, earthquake measures, earthquake preparedness, My Safe LA, ready for an earthquake, Triangle of life, video earthquake preperedness |	Comments Off on Triangle of life or Drop, Cover and Hold ? Although the current aftershocks are not mentioned anymore in the USGS and EMSC charts, the inhabitants of Christchurch are still living under the constant threat of a major aftershock and are experiencing many moderate earthquakes every couple of hours. People who want to see the strength of the quakes can consult them here. An even more better view can be seen in our dynamic seismograph mapping by the GNS Science, the New Zealand Authority who is following carefully all tectonic activity. The Magnitude aspect can reveal how powerful an earthquake is, but every earthquake will be felt differently. The duration of the shaking and a number of additional factors are as important as the Magnitude. The map hereunder is showing very well that 2 aftershocks are lasting a lot longer than all others. The most powerful aftershocks are mostly located in the Darfield area. 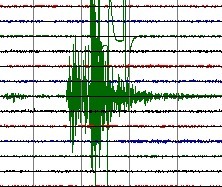 Feeble earthquake in Teton National Forest, 40 km from Jackson. This time in a slightly different area than a couple of weeks ago. Location of the epicenter has a big error margin. About 30 km out of the coast. Moderate earthquake in virgin like nature. Only nomads will have felt this earthquake. 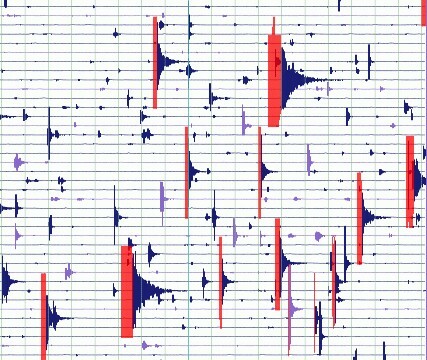 A very active earthquake area in a distant but beautiful area of Alaska. 50 km from Tanaga Volcano.